A dark and stormy night. NYU clarinet professor Esther Lamneck found herself stranded in a blizzard at Rochester airport. She mentioned to fellow would-be passenger-composer Richard Brooks-the tough time she was having finding new pieces to play with her trio. Flights resumed and shortly afterward Brooks wrote "Maelstrom" as a surprise for Lamneck and the ensemble. Thus was born this project: new rep for a familiar but somehow neglected chamber combo of flute, clarinet and piano. From jigs to gigabytes, there is a lot of new territory covered in this collection. 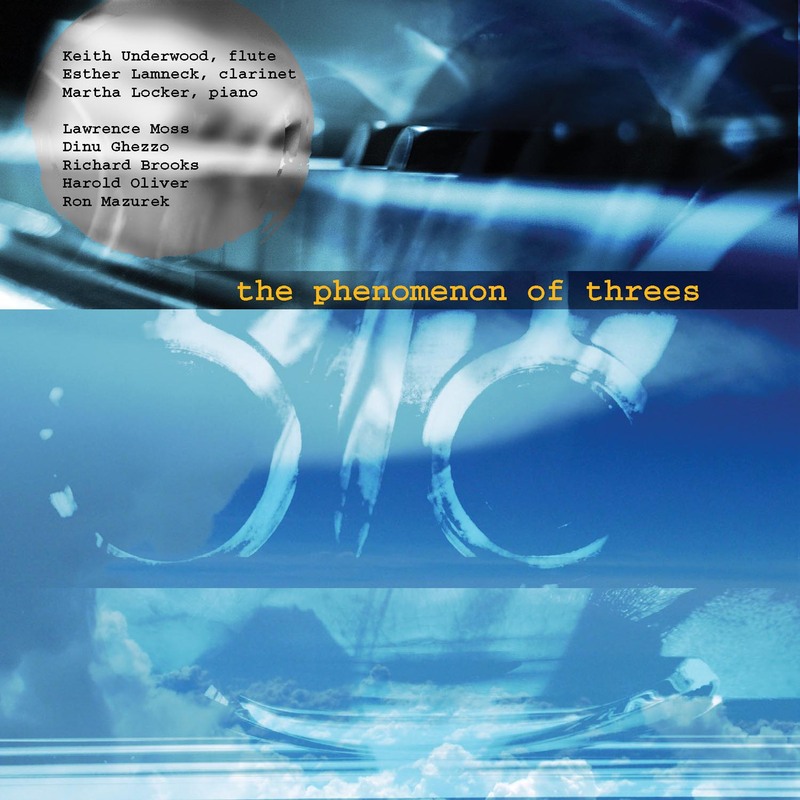 A crack team of five composers (Lawrence Moss, Dinu Ghezzo, Richard Brooks, Harold Oliver and Ron Mazurek) have spiffed up the genre and pushed the techniques of solo and ensemble writing in satisfying new directions. Students of the instruments now have meaty pieces to learn and need not rely on more Baroque transcriptions to satisfy their programming appetites. Keith Underwood and Esther Lamneck have taught flutists and clarinetists for many years and along with pianist Martha Locker they offer workshops in flute and piano repertoire and clarinet and piano repertoire at New York University's Steinhardt School, Music and Performing Arts. With this collection they can now add phenomenal repertoire for all three of them. .....The musicians deserve high praise. They play with an ideal blend of passion and precision-just what this music needs. Every aspect of their musicianship-especially their intonation, tone, rhythm, and ensemble balance- is of the highest caliber. I hope we see some of this music on concert programs, and I look forward to hearing more from this outstanding trio. The five works on this disc are nothing like I thought they would be. With the instrumentation of flute, clarinet, and piano, I imagined that the music would be showpieces for the woodwinds while the pianist provided some kind of obligatory backdrop. Instead, I found delightful and engaging chamber music. It is nice when that happens. Each of the five works has its own sense of fluidity and flow. Lawrence Moss‚ Suite is a delightful collection of miniatures, rich with color and vibrant gestures. Breezes of Yesteryear is an impressionistic-inspired fantasia that swims through time and timbres. Richard Brooks‚ three movement Circular Motions takes the performers through spritely and playful material, keeping everything light and airy the whole time. Isomorphic Plenum is the thorniest work on the disc but is engaging and compelling with rich contrapuntal lines and long, sinewy passages. The final work, A Time To∑ is an energetic and passionate work with abstracted electronic sounds which are well-orchestrated into the acoustic fabric. I preferred the shuffled vocal textures over the synth punctuations, but everything works well together. The performances on the disc are first-rate. The ensemble has a wonderful sense of blend and a smooth, rich sound overall. The cohesiveness in their playing makes every piece shine, shimmer, and sparkle regardless of compositional language. I can't wait to hear more from them! Splendidly performed by this formidable trio... technical mastery, beautiful sounds, intensity and conviction... unending passion and true involvement in the music. It is a pleasure to listen to these performances again and again. This compact disc has changed the landscape of this neglected genre forever... This compact disc is a significant and important contribution to the world of clarinet music.